during this conference which will be held from 7 until 10 March you will get the chance to negotiate with each other about the main issues and solutions on the chosen topic. Not only will you will learn how to become a team player and how to find a solution that ensures that everyone benefits from it but will you also meet great people. This conference is a great opportunity to broaden your horizons, to deepen your knowledge and negotiating skills, but also learn more about formal statements of different countries. Furthermore, it is a great opportunity to meet inspiring people with the same values and make new friends from all around the world and have lots of fun during the social activities. 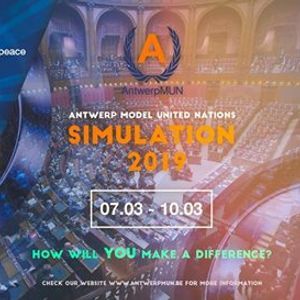 AntwerpMUN has chosen four committees for the conference and those are the following: The General Assembly of the United Nations, the Security Council of the UN, the Human Rights Council and the World Health Organization. 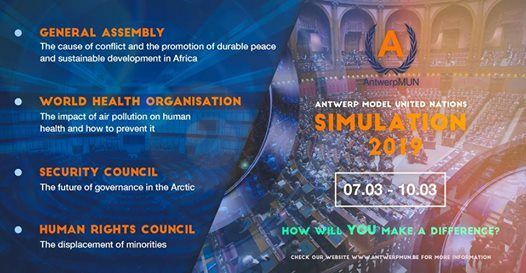 Delegates of the General Assembly will be discussing about the cause of conflict and the promotion of durable peace and sustainable development in Africa. Main focus will be laid on institutional cooperation with the African Union. Participants of the Security Council will be negotiating about the future of governance in the Arctic. The delineation of boundaries between Arctic states remains an unresolved matter. Climate change has made that this region is increasingly accessible, both for possible energy exploitation and for maritime trade routes. Representatives of the Human Rights Council will be debating about the issue of displacement of minorities in the world. How can minorities be protected against over layering with other populations? What legal or official status do minorities have? How can the forcible transfer of populations be minimized? What rights do minorities have in situations of conflict? Conference attendees that will choose for the World Health Organization will have the opportunity to discuss about the impact of air pollution on human health and ways to prevent its consequences.